A website made just for salt water pool and hot tub owners. You have questions and our goal is to come up with answers. Whether you own a salt water pool and hot tub or not, we take pride knowing that we have helped millions of owners around the world enjoy their leisure time a bit more. We are passionate about what we do and we want to help fuel that passion by providing everything from expert advice to top rated product recommendations. Trust Salt Water Pool and Spa® We spend hours upon hours researching topics and products directly related to salt water pools. We are the only website in the world that helps pool and hot tub owners with salt water technology specifically. Dan Marchuk, the founder, has been studying and enjoying pools since he was a child. His passion and attention to detail naturally lead him to educate people on a better way to do something and get excited about better products to get the job done. It eventually lead him to create Salt Water Pool and Spa and write the very successful eBook, The Complete Guide to Salt Water Pools. Every day it seems that there is something new or intriguing in the pool world. It's an ever evolving industry and that's why it's important that pool and hot tub owners have a trusted source for the latest information about the best products. Click here to receive our Free Salt Water Pool and Spa Newsletter! 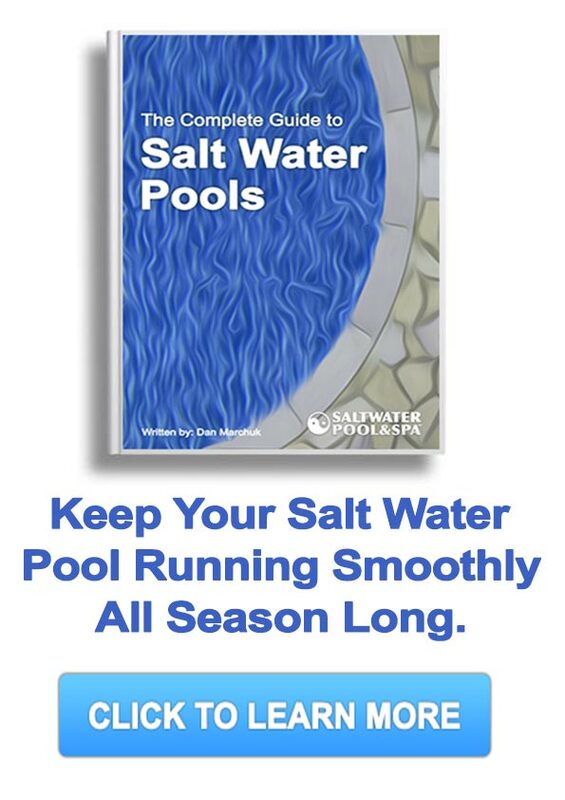 Our free newsletter is loaded with information for salt water pool and hot tub owners. We produce articles so thorough that we promise, even if you don't enjoy salt water chlorination you're still going to learn a thing or two! We connect the best products to the best people. Part of our mission is to deliver the best information and products that actually work to the people that want them the most. We are dedicated to partnering with reputable companies that have proven track records for outstanding products. There is no better feeling knowing you helped connect a customer to a product that will change their lives for the better. Here's a few samples of our work as we deliver quality information along with products that we know and trust. How Pool Automation is changing the pool industry for the better. Smart Water Care and how it's taking the hassle out of pool maintenance. Start saving up to 90% on your monthly electric bill by upgrading to a Variable Speed Pump. Save space, money and time with a brand new salt water Swim Spa. We'd love to hear from you, whether it's about how much you enjoy your salt water pool, hot tub or just to say hello. You can reach Dan Marchuk directly through LinkedIn or by filling out our contact form. Do you own a business or have a new and innovative product? Do you want to reach thousands of pool and hot tub owners eager to learn about a product or service that will make their lives better? We do it every day and we'd love to have you on board. It's as easy as filling out our Advertise form that only takes a few short minutes to complete. We want to work with the best and if that's you, we want to hear from you.